There’s nothing quite like putting on a wide-brimmed hat and riding into a town that’s just-barely civilised – a place with the whiff of the frontier about it, where everything could kick off if someone so much as raises their eyebrow at the wrong time. 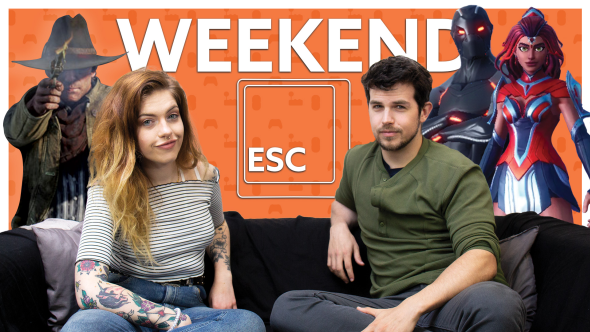 It’s in recognition of this truth that we’ve put together a special western edition of the Weekend Esc. Whether SteamWorld or Oddworld is your flavour, we’ve got the PC gaming cowboy adventure for you. Why not catch up on previous episodes of the show while you’re here? The catalyst for this sudden obsession is of course the new Red Dead Redemption 2 trailer. Elsewhere in the news, there’s Fortnite Season 4 – which has brought on a big map revamp and sudden fondness for green screen. Alice and Rich can tell you more about all that in the show. They’re also giving away a tempting mixture of goodies this week: a Dying Light T-shirt, Borderlands 2 Top Trumps, and some Ready Player One coasters. If there’s one thing a weekend’s for, it’s coasting. For a chance to win, you’ll want to interact with the widget below. The more actions you complete, the higher your chance of bagging those prizes. We ask for an email address, but only so we can contact the winner. And that’s it! Nothing left to do but prop your feet up, pretend you’re sitting on a saloon stool, and enjoy the show. Will Red Dead Redemption 2 be on PC?